This will be my fourth straight year with this challenge, originated by Annie, and now hosted by BethF. I've listed my potential choices, which can change at any moment. If I can find a book that works for another challenge too, that's even better! 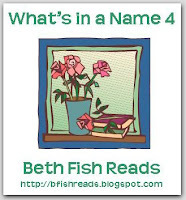 See more info at the What's In a Name 4 blog.